After two divorces actress Uma Thurman, is she in a relationship with anyone? Home Article After two divorces actress Uma Thurman is now in a relationship with her former boyfriend Andra Balazs. After two divorces actress Uma Thurman is now in a relationship with her former boyfriend Andra Balazs. Uma Thurman is a gorgeous actress who has been married twice and is currently back with her former lover. Popular actress Uma Thurman obviously considers herself a romantic. She has always openly discussed her romantic life out in the world. The 48-year-old beauty has been divorced twice and is currently dating her former lover, Andre Balazs, again. 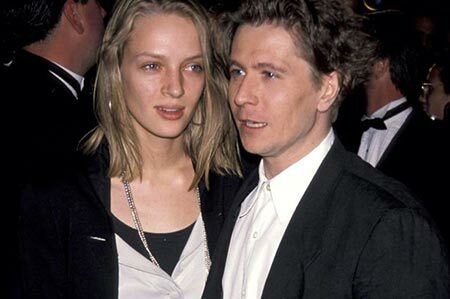 Uma Thurman and Gary Oldman got married in 1990. Gary Oldman is a 60-year-old musician, filmmaker, and actor. Uma and Gary met on the set of 'State of Grace'. The marriage was short and ended two years later. Gary Oldman has been married four times. He has also been engaged in several controversies. Gary was married to Lesly Manville from 1987 to 1990 before he married Uma and then married Donya Fiorentino (1997 – 2001) and Alexandra Edenborough (2008 – 2015) after her. Uma Thurman and Ethan Hawke met on the set of their film 'Gattaca' in 1997. Uma married Ethan on May 1, 1998. Ethan Hawke is a 48-year-old American actor, writer, and director. Uma was seven months pregnant during their wedding and admitted to getting married because of the pregnancy. The couple separated in 2003 and their divorce was finalized in August 2005. It was rumored that Uma and Ethan split because Ethan was having an affair with their nanny, Ryan Shawhughes. However, Ethan denied having an affair with Ethan while he was married to Uma and said that she has nothing to do with the end of his first marriage. Ethan also said that he is very happy in his marriage and that he regrets his first marriage with Uma. Ethan has two other children with Ryan, Clementine Jane (born 2008) and Indiana (born 2011). Arpad Busson is a London-based French multimillionaire who has a rocky relationship with Uma since 2007. Uma and Arpad started dating in 2007 and got engaged in 2008. They called off their engagement in the late 2009 but reconciled soon enough. The couple has a daughter together named Luna Thurman-Buson before finally calling off their engagement again in April 2014. Uma and Arpad went through long battles for the custody of their daughter before finally coming to an agreement. Arpad has repeatedly demanded more visitation rights and the power to make important life decisions for her. Currently, Uma is in a relationship with Andre Balazs. First, they started dating from 2004 to 2007 and then broke up. However, Uma got back together with Andre Balazs in 2015 and is currently happily in a relationship. Well, Uma seems very happy with him and we would like to wish the couple to have a happy life together ahead.